At 37 weeks with my second baby (one day before her big sister’s 3rd birthday), I came in for my regular weekly midwife appointment. The nurse took my blood pressure and saw that it was elevated (150/100). They sent me to be monitored and tested. Previously my blood pressure readings had been normal. I started to feel nervous as my blood pressure readings were not dropping and they started talking about the possibility of inducing me. I felt scared and completely unprepared because I didn’t have a hospital bag packed, I hadn’t been listening regularly to my Hypnobabies tracks every night or even washed all the baby stuff at home. I had finished reading all the chapters in the course and been listening to my pregnancy affirmations every day on the way to work so I feel like I was in a good state of mind. But the talk of induction scared me and took me by surprise. I had visualized my birthing time to start naturally around 39 weeks (after her big sister’s birthday party) and since I had my first daughter 3 days overdue, I thought maybe there was something that I had done to cause my blood pressure to go up. I then wrote a Facebook post on the Hypnobabies Support Group forum and immediately I had so many wonderful comments and reminders about what I needed to do to calm down. I realized that I still had a choice and a voice about the kind of birth I wanted. I asked my sister-in-law back home to bring me my sleep headphones so that I could listen to my Hypnobabies tracks as they wheeled me to the room where they would induce me. In the birthing room, the midwife discussed with us my high blood pressure reading. At one point it went up to 180/? She was very serious and stern about what the risks were and that the only cure was to not be pregnant. I understood the risks and accepted all her recommendations to be treated and induced and she reassured me that she was going to stay with me all night. They treated me for my high blood pressure and were able to get it down and I was administered magnesium which made me feel a little warm and sleepy. Around 6 pm, the midwife inserted a Foley catheter to help my cervix open. I used the Finger Drop technique for all cervical exams. I would ask the midwife to count to 10 while I went into hypnosis before starting. I was at 2 cm dilated, 50% effaced. They started a Pitocin drip. Over the next few hours, I felt pressure waves that were easily managed with my Hypnobabies tracks. I listened to Birthing Day Affirmations with my sleep headphones. I wasn’t really allowed to move around much and had a hard time getting comfortable so the midwife pushed a few buttons and transformed the hospital bed into a chair where I could sit upright which looked something like a “throne” and my back and arms were supported with pillows – I can’t tell you how much this position made a huge difference with allowing me to fully relax and focus on my pressure waves! About 8 pm, the midwife checked me and said that I was 5 cm dilated and she removed the Foley catheter. She recommended to break my water to try to get help get my labor moving along to which I agreed. Over the next few hours, the nurses gradually increased the Pitocin because my pressure waves were too far apart. I started to feel them getting stronger and closer but they were never “painful” to me, just pressure like a “big tight hug”. I envisioned my body opening and mainly listened to “Easy First Stage” track and zoned out while sitting on my “throne” chair. The room was getting dark and helped me become completely relaxed. I could see my husband and my sister working on their laptops in the corner of the room. I realized that I much prefer to be left alone with my sleep headphones in the dark during my birthing time in order for me to fully focus. For my 1st birth, I had the Hypnobabies tracks playing out loud but I wasn’t able to really concentrate. Right around 11 pm, my pressure waves were getting much stronger and closer together. I started to feel sweaty and wondered if I could go on much longer because they were so intense. I pushed myself deeper into hypnosis while listening to the same “Easy First Stage” track and counted down from 5 to 1 for each pressure wave. I kept reminding myself to relax my mouth and face muscles and repeated my Peace cue over and over again and it brought instant release. A few times, I asked my husband to come over and kiss me on my lips and that definitely helped me relax. I realized afterwards that this was when I was going through transformation because the pressure waves were so intense and I could feel the baby getting lower and lower. I told my husband/sister that I started to feel “pushy” and made grunting noises. With each pressure wave after that, the baby was getting lower and lower and I just knew that the baby would be out any minute. I shouted out “I’m pushy!” so that my husband/sister could call the midwife as they were just watching me in silence. I knew with the next few pressure waves I would start pushing so then I got on all fours which was the only position that felt right to me at the time. I wanted to use gravity to my advantage (for my previous birth, I pushed for 3.5 hours on my back). I heard the midwife come in, thinking that she needed to check my dilation and she quickly realized the baby’s head was crowning and urgently called for the nurses to come in. I quickly stopped for 5 seconds to change what I was listening to the “Pushing Baby Out” track and then I let my body to do the rest… I felt a very powerful bowel movement-like urge push through my body and I just surrendered and let it go. I faintly heard the midwife ask me to slow down pushing through my headphones, but the urge was so powerful I couldn’t stop it. At 11:47 pm, with another push the midwife caught my baby and put her on my back for a few seconds. She asked me to reach under and get my baby. I did and laid on my back while I cuddled and admired my sweet baby girl. She was 6lbs 6oz. I felt instant relief and happiness at that moment. 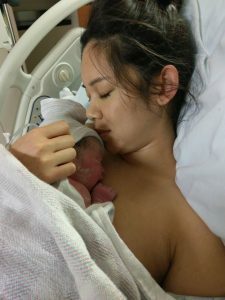 I did continue to use the “Peace” cue as the midwife was stitching me up (2nd degree tears) and pressing on my belly – I was more focused on staring at my baby. Even though I wasn’t expecting the induction and high blood pressure complications, I was able to have my baby vaginally without any pain medications and calmly in the most intimate environment possible considering the circumstances. I felt confusion, guilt and worry from the sudden Preeclampsia, but I am still 100% happier with how quickly and easily this birth happened than with my first and using everything I learned from my Hypnobabies training made this possible. My midwife and the nurses were all amazed on how I handled my birthing time and have raved about me to other moms and wanted to know more about the Hypnobabies program. They had never seen anything like it. My total birthing time was about 6 hours and I could not thank my amazing husband, sister and the wonderful nurses and midwives for doing their best to grant me my wishes and keeping me safe at the same time.